Winter is almost over and we are all suffering from winter itch so what better time is there than to take an opportunity & explore all of the fun things to do in Kansas City? Whether you are a Kansas City native or a visitor from another city, Kansas City is one of the most fascinating & magical cities in the US; from first-class shopping to a world-renowned music & art scene and an epicenter of multi-cultural cuisine and cocktails! Taste of Kansas City Food Tours– Food tours have become one of tourism’s most requested activity and the Kansas City area is no different. Nelson Atkins Museum– The Nelson-Atkins Museum of Art is an art museum in Kansas City, Missouri, known for its neoclassical architecture and extensive collection of Asian art. In 2007, Time magazine ranked the museum’s new Bloch Building number one on its list of “The 10 Best (New and Upcoming) Architectural Marvels” which considered candidates from around the globe. Liberty Memorial/Federal Reserve– Our Liberty Memorial located at 100 W. 26th Street, Kansas City, MO is a memorial that was dedicated on Nov. 11, 1926 to the soldiers who died in World War I. The restored 1906 historic bank lobby is one of the most magnificent spaces in the Central Library as it is the first interior view that customers experience as they enter the Library. This impressive space houses the popular materials collection on the first floor among the restored columns. Modeled after library reading rooms of the early 20th century, this room includes traditional library seating with custom-designed tables wired for modern computer usage. The Grand Reading Room is located on the third floor and is surrounded by the H&R Block Business & Career Center, Reference Collection, and Periodicals Collection. Architectural features include a distinctive, 34-foot ceiling with skylight. The old bank Vault, part of the 1925 bank addition, proves one of the most distinctive and unique features in the building with walls of steel and reinforced concrete and a 35-ton steel door. A variety of programming specific to the Vault Theater are presented in partnership with local film societies and organizations. This themed space on the second floor welcomes children and encourages them to browse the collection, read aloud in small groups or to themselves, and look at picture books. This space, and the books housed within in it, provides more than just opportunities for “story times,” it provides a unique setting in which children can take their own journey into the exciting and life-enriching world of books. A teen library is also available in this space. 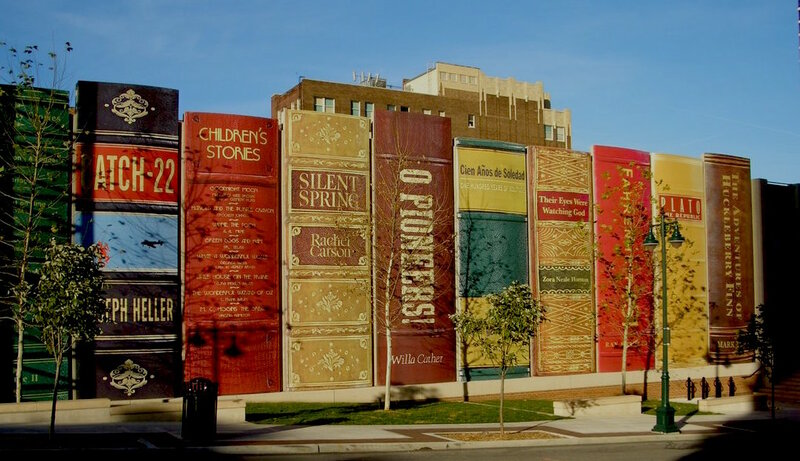 The Community Bookshelf is a striking feature of Kansas City’s downtown. It runs along the south wall of the Central Library’s parking garage on 10th Street between Wyandotte Street and Baltimore Avenue. The book spines, which measure approximately 25 feet by 9 feet, are made of signboard mylar. The shelf showcases 22 titles reflecting a wide variety of reading interests as suggested by Kansas City readers and then selected by The Kansas City Public Library Board of Trustees. It was completed by the fall of 2004.